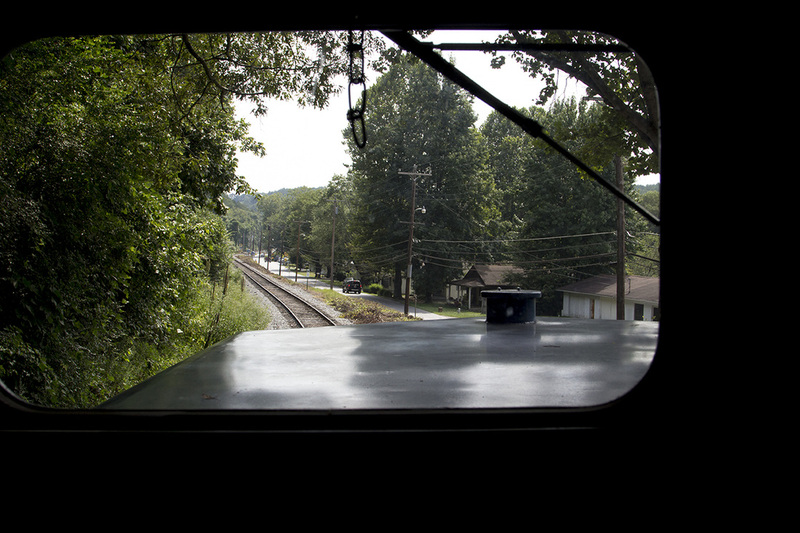 From Blue Ridge, Ga., you can either drive by car 10 minutes to McCaysville, Ga./Copperhill, Tenn. (approximately 13 miles one way) or take the train for a one-hour's ride. I vote for the train. 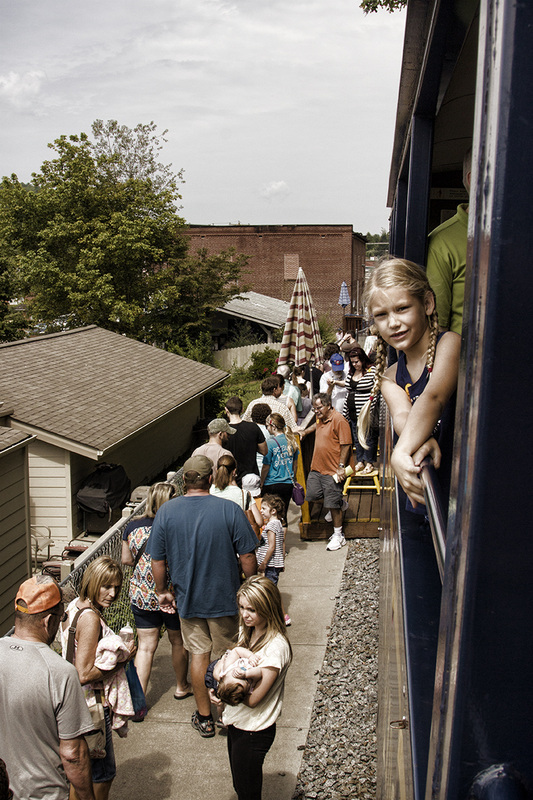 There's a crowd gathering along the tracks on this hot Sunday afternoon. As I get closer to the train and my inner child squeals begin to escape, I hear four blasts - the signal that declares if you're going, you better get on board. The child in me moves faster. Air-conditioned car or open air? Of course, there's no decision - open air car all the way. 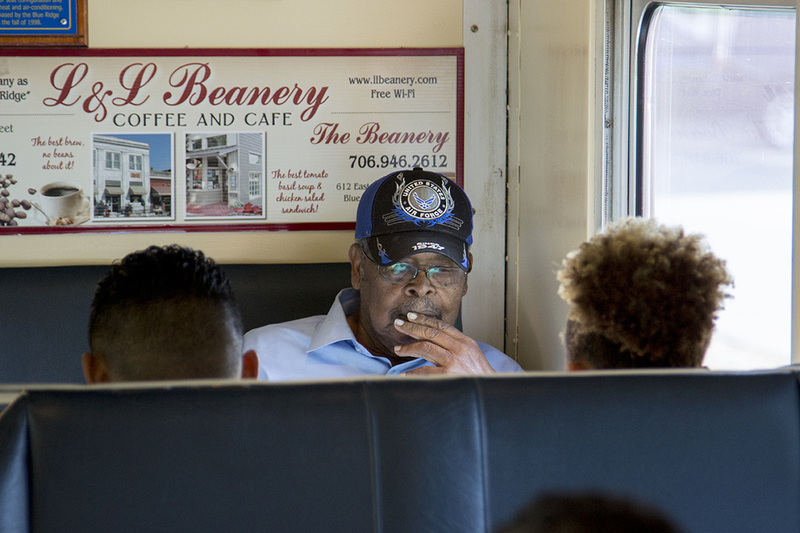 Yes, it's a sizzling hot August Georgia afternoon, but I'm on a train! I find my spot on the river's side, prop my feet up and wait for the breeze, for I'm on a train. Operations Manager Tim Griffin strolls through the cars, checking to make sure that everyone is in the mood for a fun ride. Asking children and adults the same question, "Are you ready?" I answer a "yes" in resounding unison with the others. 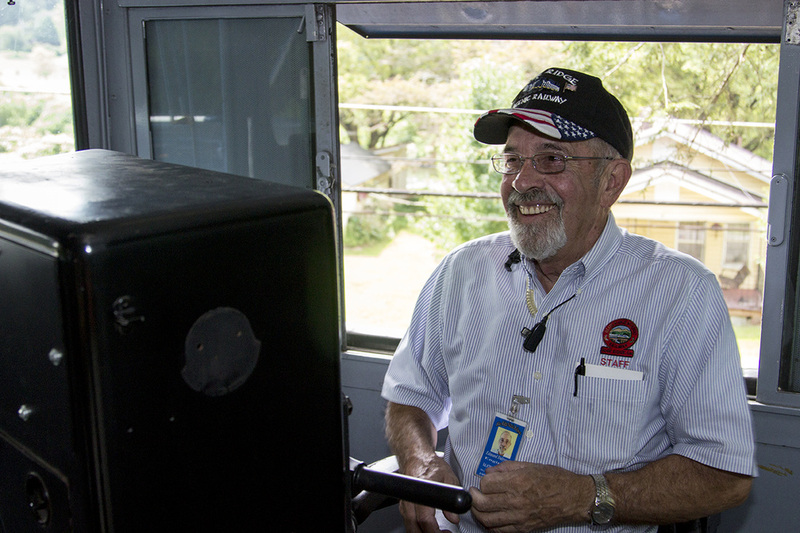 Following in his footsteps in every car is your very own crew member (lower right), offering rules and traditions to be followed by every passenger. 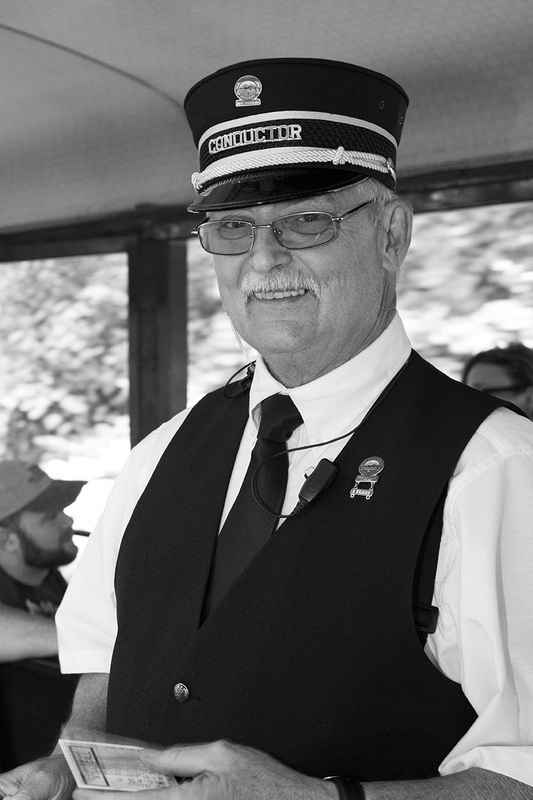 They also answer impromptu questions about the river - like how it starts out in Blue Ridge as the Toccoa River and once it passes the Tennessee state line, becomes the Ocoee River - and about the train's destination - about your unbelievable opportunity to actually be in Georgia and Tennessee at the same time and not get hurt. I feel like we're in good hands - two conductors on this trip. 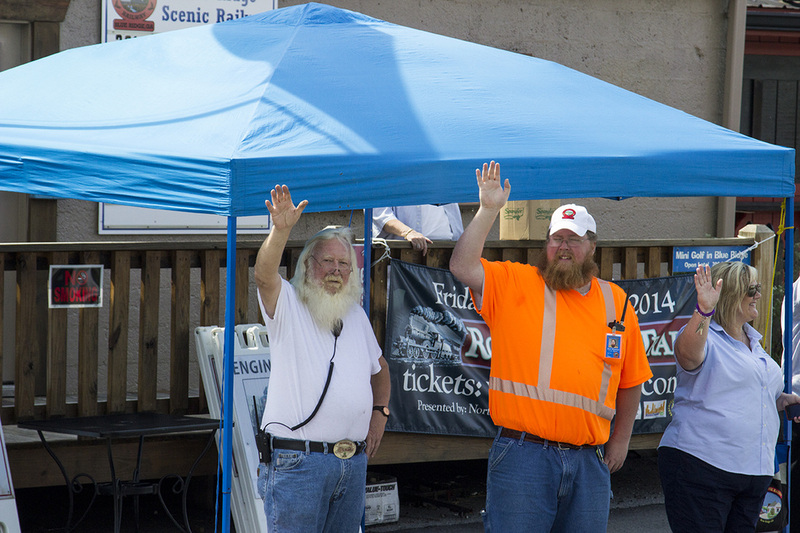 Come to find out Tom Patterson (right) is a cub conductor, the name given to one in training. It's his second trip learning the ropes and after today, he'll be conducting solo. His teacher Ray Leader (above left) was the first conductor on this line. 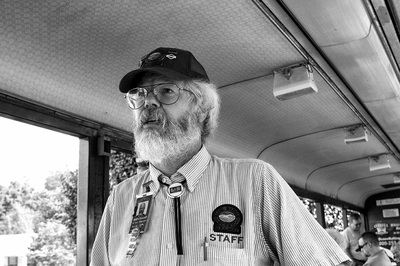 With a long honored career in aviation, Leader helped build the Blue Ridge Scenic Railway back in 1996 when a group of investors saw the potential of a passenger trail riding through the mountains of Blue Ridge. 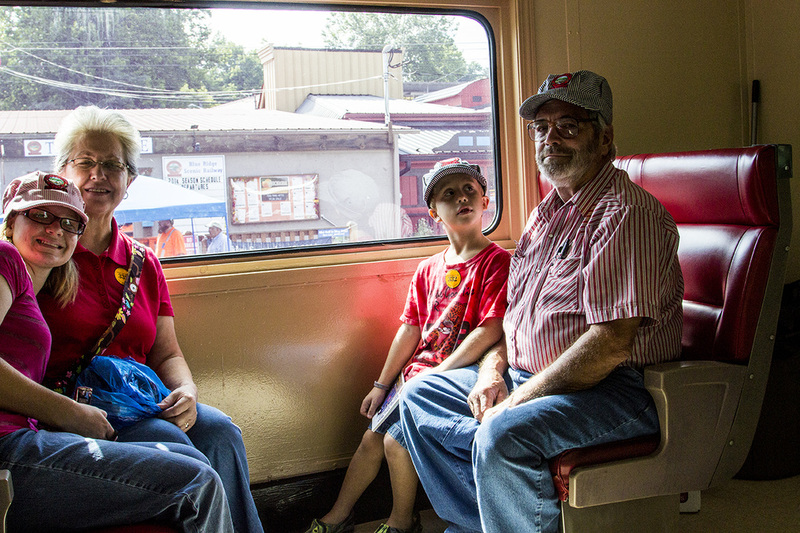 "I did have a little reservation when I walked into Blue Ridge and wondered how you would run an excursion train out of a ghost town." Does he have any reservations about the train's success today? "Not a bit," he says without a second's hesitation for today, Blue Ridge is anything but a ghost town. Thanks, in part, to the railway. 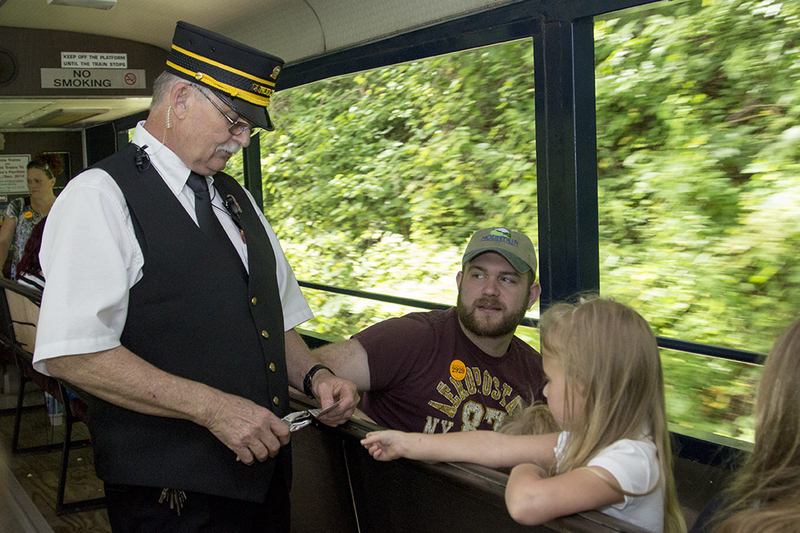 Conductor Tom Patterson stamps the ticket of Emily Baker of Acworth, Ga.
Rule #1: According to the staff, you must "wave at anything that moves or stops for the train horn." And, you must "keep all of you inside the train" at all times. I think we can handle that. Rule #2: You must smile and you must admire the man wearing the conductor's hat sitting next to you for you look just as dapper as he. If you're going round trip, you'll have 26 miles or almost 4 hours to get to know each other better. 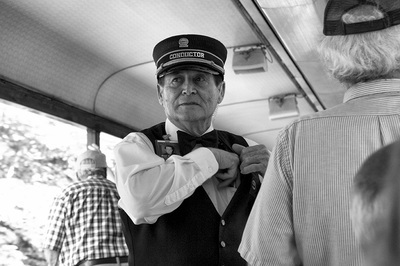 Rule #3: Enjoy the air conditioning in the vintage train cars. 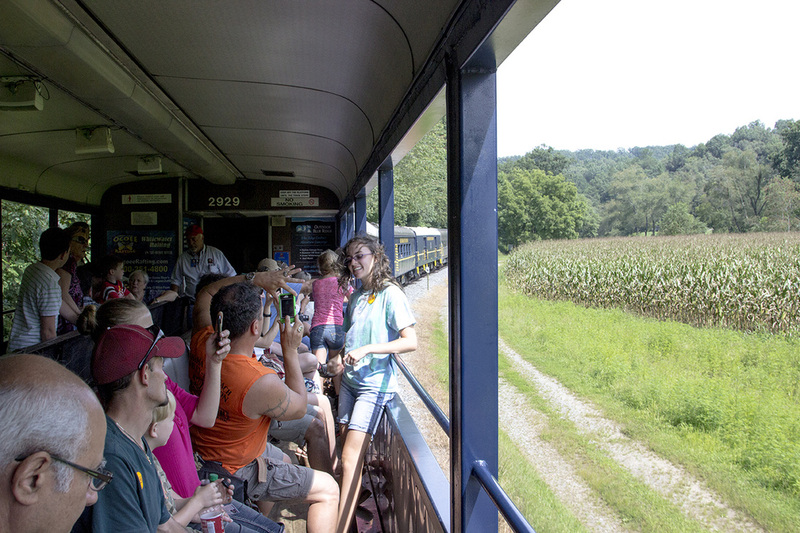 There's also a concession car for souvenirs, popcorn and soda. 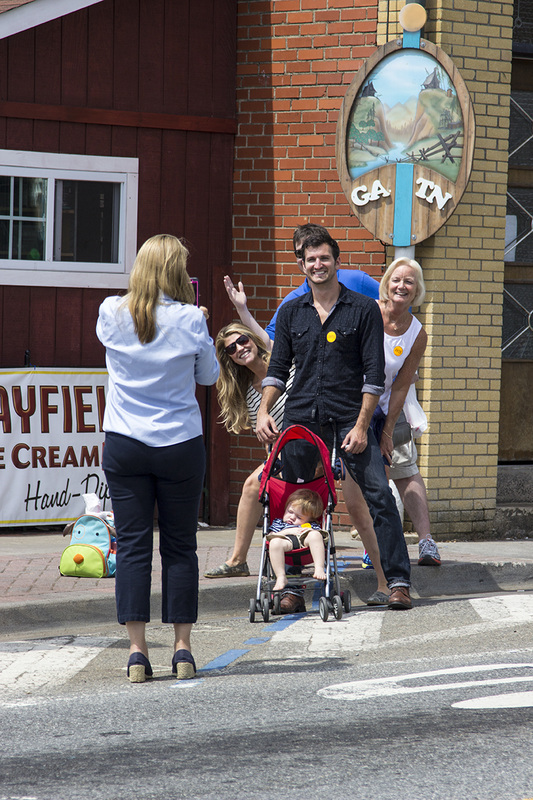 If you like, bring your own picnic (as many did on this day) and during the mid-way stop in McCaysville, stay on board and enjoy lunch. You'll have about 2 hours there to enjoy the shops and take the famous tourist pic. Rule #4: Take the famous tourist pic. See the blue line on the road? That's where Georgia and Tennessee intersect. What you can't see is the horrid orange fire hydrant that sits on the Georgia side. The horror! I photographed this on purpose - without the Volunteer orange. Rule #5: Never forget to look back. Edmund Dalrymple (below) has had the "best seat in the house" for 26 years. As engineer, he hauled freight for 21 years before leading the way from the front seat at the Scenic Railway. After the steepest 7- step climb of my life to the engine room (you can climb these too, but rides in the engine are limited) during the mid-stop "brake test" and changing of engines, Dalrymple explained how this 100- year-old line had been dormant since the 60s, that is, until some people who had a bright idea to open the railway as a tourist attraction. The idea still shines brightly as ever.